A New York Times article recently stirred up a lot of discussion amongst the children’s lit community about the future of picture books. I don’t think the decline in sales was news to anyone. Picture book sales have been slowly dropping for about the past ten years because of changing demographics. And with the economic downturn of 2008, no one is surprised that people are thinking twice before spending $16-$18 for a picture book. However, the part of the article that concerned me was the claim that parents are “skipping” picture books and heading straight to chapter books in an effort to “advance their children’s skills.” The idea of doing this is simply absurd. This would be similar to a parent saying that they would not allow their baby to crawl because learning to walk sooner would make him/her a better runner, headed for an Olympic bid. It just isn’t true. Or smart. There are basic developmental stages a child progresses through in order to develop normally (by “normally” I mean develop according to the expected, universal stages of human development). And here is where picture books fit in. Picture books offer benefits to children that no other genre can. One cannot simply “skip” them and advance onto chapter books because picture books and chapter books are NOT THE SAME. Just like crawling and walking. Crawling teaches forward movement, coordination of limbs and exercises both sides of the brain—all in the safety of being at ground level. Picture books enrich a child’s life in many aspects and prepare him for reading chapter books and his future learning–in the warm embrace of a parent or other caregiver. It is all good, and all necessary. LANGUAGE:Young children (ages two-seven) are at a peak age for learning language. Dr. Jane Healy (Endangered Minds: Why Children Don’t Think and What We Can Do About It) notes that the young child’s brain is ravenous for language stimulation. This is why it is often suggested that children learn a second language at this age. They soak up language like a sponge. Because the average picture book only has about 500 words, an author must craft each and every word, sentence and paragraph with care. Editor Anne Hoppe once said of picture books: “The writer distills; the illustrator expands.” Picture book writers must distill language to its very essence. This is why the text in a picture book is often rich, evocative, and engaging. Hearing this type of language will enrich a child’s language development. BRAIN DEVELOPMENT:Dr. Healy (Your Childs’ Growing Mind) also explains that during early childhood, the brain buzzes with extra neurological connections that are trying to establish patterns, cause and effect, and sequences. Picture books, with their verbal and visual nature, offer this to a child’s growing mind. For example, in Bill Martin Jr.’s Brown Bear, Brown Bear, What Do You See? a child hears the verbal clue of a rhyming word and sees the visual clue of the upcoming animal to be named on the next page. This type of pattern and sequencing helps to build the neurological pathways in a child’s brain. This kind of patterning within a verbal/visual format is unique to picture books. 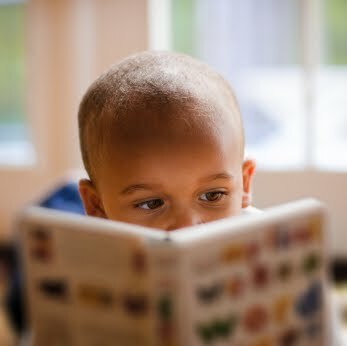 PHYSICAL PARTICIPATION:Another unique aspect of picture books is the child’s physical participation in the story via the page turn. The words and illustration allow the child to experience what is happening on any particular page; however, advancing the story—physically turning the page—requires action on his part. This type of participation sets up an interactive experience between the child and the story. This participation also keeps the child engaged and helps to establish cause-and-effect brain pathways, as mentioned above. Because of their unique structure, picture books can help a child increase his attention span, going beyond an interesting story (which is common to all genres). How many picture books have you seen with a refrain that keeps a child listening—eagerly anticipating his moment to chime in? Children will sit on the edges of their seats (or knees) awaiting their moment to be an active part of a story. Have you ever seen a group of children listen to Don’t Let the Pigeon Drive the Bus! by Mo Willems? Children’s author Mem Fox says in her book, Reading Magic: “Children’s brains are only 25 percent developed at birth. From that moment, whenever a baby is fed, cuddled, played with, talked to, sung to or read to, the other 75 percent of its brain begins to develop. And the more stimulation the baby has through its senses of touch, taste, smell, sight, and hearing, the more rapidly that development will occur.” Re-read that last sentence. The more stimulation through the senses, the more rapid the development occurs. Multi-sensory learning is critical during the early childhood years, and no other book genre offers this kind of sensory-based experience. While listening to and looking at a picture book, a child sees the pictures, hears the words, touches the pages (or other tactile features, such as touch-and-feel books), and smells the pages (such as scratch-and-sniff books). The only thing a child wouldn’t do with a picture book is taste it (although infants and toddlers might disagree). Dr. Maria Montessori advocated that children absorb impressions and knowledge directly from their environment via their senses. Picture books are an important part of the learning process. No other type of books gives young children the opportunity to experience a story on so many sensory levels. I hope this has given you some reasons to consider the benefits that picture books uniquely offer a young child. For a comprehensive list of excellent picture books, please visit Elizabeth Bird’s Fuse #8 blog. Excellent post. I think it's irresponsible that the NYTimes printed that. Picture books are definitly still sold,read, and very valuable to a child. Even when I was a third and fourth grade teacher, I would read picture books occasionally when they went along with our unit or even just as a fun five minute breather. The students still enjoyed them. I read aloud chapter books regularly to them, but they never objected to the occasional picture books and truly enjoyed them. Well done, Terry! Your reasoning makes perfect sense. Thanks, everyone. I just hope the Time's article prompts others to help to spread the word about the role that picture books play in a child's development. What an excellent post. I just loved the cozy feeling of cuddling up with my boys while reading a picture book together. Nothing can replace that! I love that you've used such terrific support for your point, Terry. This is a post really worth getting out in the mainstream! Amen, sister! No wonder my kids are smart than me. Well said, Terry! Your post is a scholarly, well-documented essay that needs to be read in many places! I think this is the saddest posting I have read for sometime. Why can't parents let children be children. Allow them to grow gracefully instead of being force fed. We couldn't have said it better ourselves — what a well-researched and well-written post! We agree with you on all fronts. We plan to continue to publish wonderful, whimsical picture books and trust that parents will continue to share them with their eager youngsters. I am in total agreement. I think that's why I became a children's book author. When I travel to schools to do author visits, the kids are in awe. They are still reading picture books. Sometimes, I wonder where the polls are coming from. Reading helps children in so many ways. I even posted (on Facebook) that reading to my daughter has given her the skills to now read to me. Great post.